The following chapters will help you relieve pain, repair dysfunction and maintain the tendons, muscles and joints in any region of your body. Whatever problems you are having, be they immediate, inherited or ongoing, the 3D animation in the introduction to each chapter will give you a fuller understanding of what is happening in your body and the triggers to pain. Remember, prevention is better than cure so get ahead of any problems by following the routines in each chapter. There are many reasons why you get a sore lower back. Too much sitting, inherited tendencies or poor habits will contribute. In simple terms it is because there is too much tension in some muscles and too much slack in others. 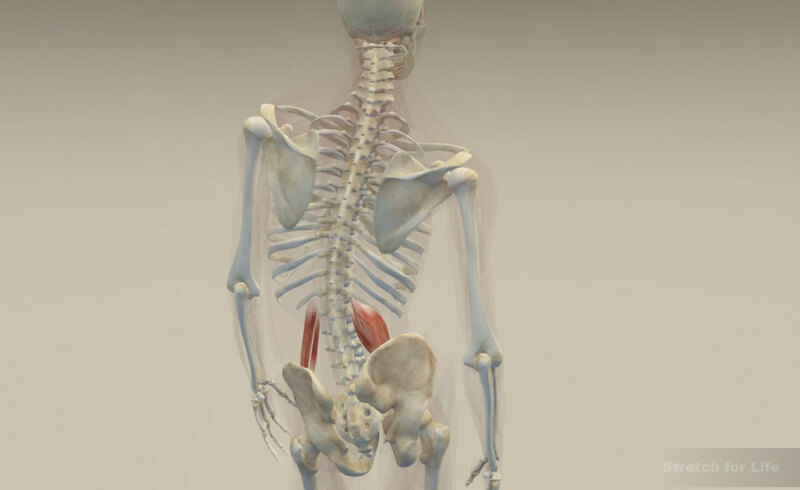 The mechanics of the spine, sacrum and pelvis become dysfunctional and you become increasingly susceptible to injury. Mostly there is a gradual build up of tension over time, the body adapts to this until it can no longer accommodate such levels of tension. Then some small event happens and you end up in huge amounts of pain. This chapter will explain the triggers to lower back problems and the 3D animation will show how the lower back function and the reasons for discomfort or pain. The stretching routines will overcome present problems and prevent future ones. HD Video perfect for your tablet, smart tv, computer or mobile device. DL-V201 The Complete Lower Back Chapter. From The Lower Body Stretch for Life DVD. Pain in the groin is common. The muscle usually involved is the Hip Flexor or Psoas. It is attached to the front of each of the lumbar vertebrae. It traverses through the pelvis and exits at the groin attaching to the upper thigh bone or Femur. 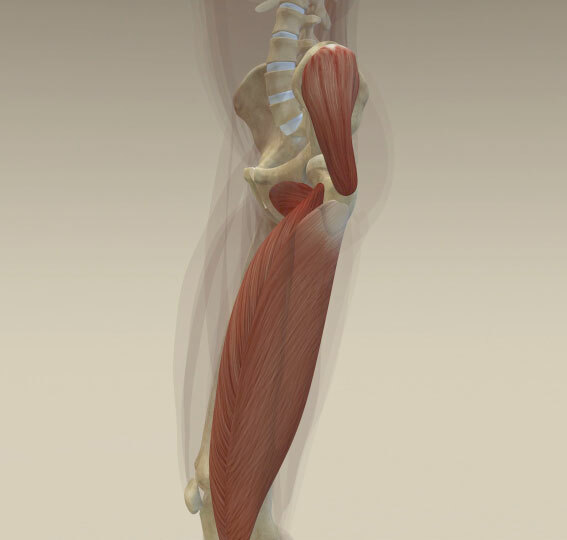 Tightness in this muscle can cause inflammation at its attachment point creating pain in the groin. The main muscles that cause grief are called Gluteus Medius and Gluteus Minimus. They are the smaller cousins of the bigger buttock muscle Gluteus Maximus which is looser by nature. These muscles are often tight and the pain pattern is typically quite defined to the lateral hip area. 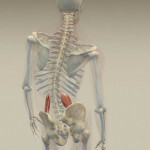 This chapter will explain the triggers to hips and pelvis problems and the 3D animation will show how the hips and pelvis function and the reasons for discomfort or pain. The stretching routines will overcome present problems and prevent future ones. DL-V202a The Complete Hips and Pelvis Chapter. From The Lower Body Stretch for Life DVD. Ligamentous straps hold the knee joint together and the muscles that come down from the thigh, wrap around the knee and attach to the lower leg. Muscle pain typically presents in the belly of the muscle or where it attaches to the bone. A painful joint is often the tightness of the muscle pulling at its attachment point. Pain on the inside of the knee is likely excessive tension in the Adductor group – the muscles on the inside of the leg. Pain above, below or under your knee cap could be excessive tension in the Quad group. Pain at the back of the knee can be the result of hamstring tension. Pain on the outside can be excessive tension in the ITB. Cartilage disc or ligament damage can be another reason for pain in the knee. This chapter will explain the triggers to knee and thigh problems and the 3D animation will show how the knees and thighs function and the reasons for discomfort or pain. The stretching routines will overcome present problems and prevent future ones. DL-V203 The Complete Knees and Thighs Chapter. From The Lower Body Stretch for Life DVD. Our feet and ankles do a huge amount of work. They are like springs. Arches length ways and across the fore foot act like shock absorbers. They are held and maintained by muscles and ligaments in the foot and up into the leg. A number of common situations can result in foot, ankle and leg problems. Excessive muscle tension in the leg prevents the foot from flexing thus placing more strain on the spring dynamic of the foot and muscle attachments. 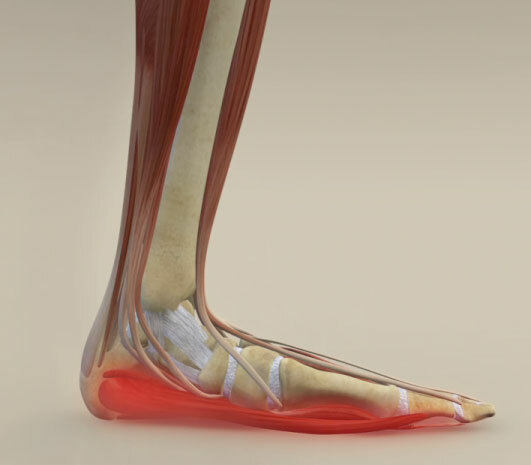 This commonly presents as Achilles tendon inflammation at the back of the heel. Also shin splints where the muscle on the front of the leg (shin) is pulling excessively at its attachment to the bone. 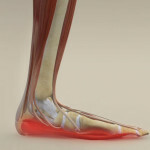 This chapter will explain the triggers to legs, feet and ankle problems and the 3D animation will show how these function and the reasons for discomfort or pain. The stretching routines will overcome present problems and prevent future ones. Wellness expert and osteopath Tim Judd presents a complete stretching routine to maintain your lower body. This routine is aimed at people who have completed each SFL chapter of the Lower Body as there are no accompanying instructions on how to do the stretches properly and effectively. For those of you who have no pain issues, any of these stretches can be added to your current routine. There is no better stretch than when someone else does it to you. Wellness expert and osteopath Tim Judd presents a complete assisted stretching routine for you and a stretch partner to maintain your lower body. This routine is aimed at people who have completed each SFL chapter of the Lower Body as there are no accompanying instructions on how to do the stretches properly and effectively. It is important that both you and your stretch partner have watched the relevant chapters. A good stretch partner is mindful of your pain threshold and tolerance. Wellness expert and osteopath Tim Judd has designed a complete routine of strengthening exercises for your Upper and Lower back, Abdominal muscles and Legs. Once you have relief from pain and repaired dysfunction by going through the SFL upper and lower back chapters, you are ready to strengthen these zones of your body for ongoing prevention and maintenance. This routine uses a combination of exercises and stretches from the relevant SFL chapters so no instructions are given. If you are pain free and dysfunction free you can add any of these to your current workout routine. Osteopath and wellness expert Tim Judd will help you understand and implement good everyday postural habits at home and in the workplace. Slouching and slumping puts unnecessary strain on your neck, shoulders and upper back. Bad posture causes a domino effect of pain and discomfort throughout your whole body. Sitting or standing at home or at work or driving a vehicle is something we all do for long periods. Explore simple techniques and habits that will improve your posture and thereby your health. The introduction will make very clear to you the importance of good posture. DL-V108 The Complete Posture Chapter. From The Upper and Lower Body Stretch for Life DVD.